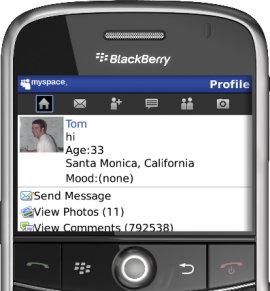 RIM has found a huge success with it’s Myspace application for BlackBerry devices. It’s been a week since the application has been up and it has been downloaded over 400,00 times which is a huge hit for both RIM and Myspace for application downloads in a week. Since the launch, users have sent and received more than 15 million messages and updated their moods and status over two million times. Â RIM also announced the Storm version of the application will be coming out on November 24. If you donâ€™t already have the app, you can pick it up atÂ www.blackberry.com/myspaceÂ orÂ m.myspace.com.